Here’s a great drill to improve your infielder’s movement, quickness and short throws. Maximize reps while minimizing throws. Arms get tired and sore this time of year so increasing defensive reps while limiting throws is a challenge. Having the right touch on throws around bases and quickness for the short game is also a challenge, so here’s a drill that works on both without wearing out your players arms. I don’t have a name for this drill, so feel free to come up with one on your own. It’s an infielders drill (pitchers and catchers can also do it), and requires 2 players per base, and can happen simultaneously at all 4 bases. 2 players at each base (including home). Each player has their glove on. 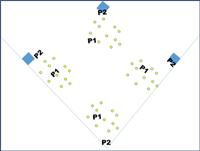 Scatter 10 – 15 balls around in front of each base. Player 1 starts in her defensive position while Player 2 starts on the base. So Go! Player 1 sprints out to pick up any ball, turns and throws it to Player 2 covering the base. Player 2 just tosses the ball off to the side, and is immediately ready for the next throw. 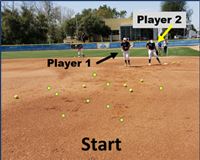 Player 1 goes back to her starting defensive position and then continues quickly to another ball until she’s picked up and thrown each ball to her teammate covering the base. The two players then switch. The whole thing takes about 5-8 minutes and gets a lot of quick fielding reps and short throws. For more help with your coaching, become a Vault Classic member and enjoy hundreds of drills, eClinics and ePractices!